Weddings Costs > How Much Do Publix Wedding Cakes Cost? How Much Do Publix Wedding Cakes Cost? The Publix Bakery is well known for making superior quality wedding cakes. Their experienced and gifted cake designers work with you to help in creating the ideal cake for your special event. They customize the cakes according to your liking with your choice of flavors, icing, and filling in the perfect color, size and shape. How much does a Publix wedding cake cost? The cost of a Publix wedding cake will depend on the size, the customization and the type of cake you purchase. From what we researched, a plain cake for the average wedding can cost $200 to $400, but as you add decorations and additional tiers, the costs can increase. However, most couples, even after they decorate their wedding cake, reported paying $275 to $450. NOTE: The quote above should be used as an estimate only. To budget, the top number should be budgeted for every 20 guests attending your wedding. If 100 guests were attending, then it would be safe to multiply the total by five. According to one member on this WeddingWire.com forum thread, a bride said she paid $350 for a wedding cake from Publix that served more than 250 guests. On this CakeCentral.com forum thread, a member was quoted $440 for a three-tiered cake, which had 8, 10 and 12-inch layers and used fondant. On the other hand, the same sized cake with buttercream frosting was quoted for $295. TheKitchn.com says the average Publix wedding cake for about 100 guests will be close to $400. Sizes range from as little as six inches to as large as 20 inches in size. Publix created a guide to show you what each size can serve. The cake flavors available include vanilla, marble, chocolate, vanilla chocolate combo, Red Velvet or carrot, and the icing can either be buttercream, cream cheese, rolled fondant or fudge. As for the fillings, options include raspberry, lemon, vanilla custard, cherry, fresh strawberries, cannoli, chocolate pudding, and German Chocolate. Extra flavors may be available on request. All in all, the grocery store offers four types of icings, five cake flavors, eight fillings and 24 standard icing colors. Publix offers more than 50 designs, ranging from the Blossoming Romance theme to a Classic Rose. You can browse all of the designs available, with pictures on their official wedding cake page. Vanilla, chocolate, or a combination of vanilla and chocolate, and marble are available for no additional charge. However, if you were to choose another flavor, as mentioned in our table, the costs will increase slightly. Publix charges $30 to deliver up to 10 miles; $40 between 10 and 20 miles; $50 between 20 and 30 miles; and $50 plus another $2 per mile for trips over 30 miles. When they do deliver the cake, Publix will set up the cake according to the number of tiers, shape, and table decorations of your choice. There are additional charges for cream cheese and fudge icings, fruit and cannoli fillings, whipped toppings, German Chocolate cakes, black forest cakes, and carrot cakes. A cake topper, if chosen, will be an additional cost to consider. If your cake needs a stand or acrylic legs used to build the cake tiers, the Publix bakery will require a deposit for these items. However, this deposit is returned when all of the pieces used are returned in good condition. 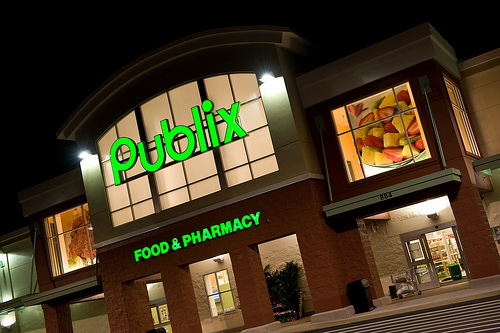 Publix recommends placing your order no earlier than two months prior to your event to ensure the bakery team is given sufficient time. No deposit is necessary as the cake will be paid for in person. Plain cakes will always be the cheapest option, and if you want to save the most money, highly consider decorating the cake on your own to save at least $50 to $100. Consider buying discounted gift cards for Publix on Raise.com.